The neural crest is a transient embryonic tissue that originates from the border of the neural plate prior to delamination and migration throughout the developing embryo, where it contributes to a wide range of different tissues. Defects in neural crest development have been implicated in a variety of different disorders (neurocristopathies) including cancers, neuropathies, craniofacial malformations, and pigment disorders. 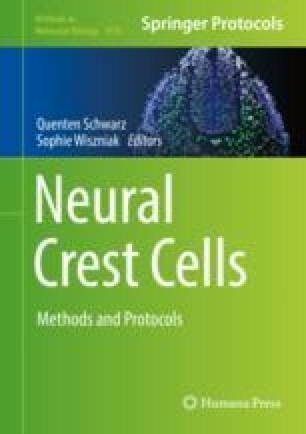 The differentiation of human pluripotent stem cells (hPSCs) into an in vitro counterpart to neural crest cells holds huge potential for the study of neural crest development, as well as modeling neurocristopathy, carrying out drug discovery experiments and eventually cell replacement therapy. Here we describe a method for generating human neural crest cells from hPSCs that is fully defined and free from animal-derived components. We found that in the absence of serum or bovine serum albumin (BSA), variability in endogenous BMP expression leads to unpredictable differentiation efficiency. In order to control against this issue, we have developed a system termed “top-down inhibition” (TDi) that allows robust neural crest induction as described below. The H9: SOX10 BAC hESC line used in the development of this protocol and in generating the data presented in Fig. 2 was kindly provided by Lorenz Studer, Mark Tomishima, and Yvonne Mica. Funding: This work was funded by grants from the Medical Research Council (R/143416-14-1) and the European Community’s Seventh Framework Programme (FP7/2007-2013 under grant agreement no 602423).